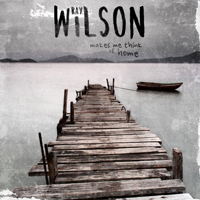 progVisions would like to give singer Ray Wilson some extra attention. Most of you will remember him as the other singer of Genesis. He did a wonderful job on “Calling all Stations”, the latest studio effort and in my opinion still an underrated album of that famous band. And he made quite an impression with his more acoustic and classical live versions of Genesis material. But he also (co)writes his own material. This year he has released two new albums. On the first of those two albums (“Makes me think of home”) he wrote as co-writer together with keyboard player Peter Hoff most of the tracks. And on the other, more acoustic album (“Song for a friend”) the music is of guitarist Uwe Metzler and the lyrics are composed by Ray. progVisions will review both albums. But first we will have a look at the album “Makes me think of home”. The first track of the album is called “They never should have sent you roses”. Before the first acoustic guitar notes kick in, you hear the sound of some bagpipes in the distance. That is Ray's connection with Scotland ... Ray is thinking of home. The music the Ray Wilson band is making could be described as refined singer/songwriter pop songs. You can enjoy the most beautiful vocal melodies on this album that are sung with that unique voice of Ray. A wonderful voice that sounds a little bit hoarse. In the song “The next life” and the track “Anyone out there” the acoustic setting of the music is enriched with the sound of the saxophone. “Tennessee mountain”s sounds light and radiates the atmosphere of summer. “Worship the sun” has a nice vocal refrain and you can hear the exceptional use of Ray's voice. Ray is blessed with one of the best voices in the scene. Just listen to the title track “Makes me think of home”, one of my favorites of this wonderful album. The tension of the music is slowly building up towards a kind of climax. A wonderful and diverse composition with a beautiful and instrumental middle section with first acoustic guitar and flute and later on electric guitar and saxophone solo's. “Makes me think of home” is the longest track (7:58) and is together with opener “They never should have sent you roses” maybe the best composition of this album. The short track (3:42) “Don't wait for me” and “Calvin and Hobbes” are also sticking out with beautiful vocal melodies. These compositions are of guitarist Scott Spence and besides the already mentioned beautiful vocal melodies “Calvin and Hobbes” is standing out because of the great orchestration of Scott. The last song “The spirit” has even some country influences. So you can say that this album has the diversity that is needed to keep the attention of the listener. Of course this is not a progressive rock album but as open minded music lover you will enjoy this album with lovely vocal melodies. I am sure you will like the title track “Makes me think of home”. Not only the longest track of the album but also a composition with great diversity. And as I mentioned before, Ray Wilson is blessed with a great voice that makes him an exceptional singer. Looking forward to review the next one, “Song for a friend”. An album that was released earlier this year and that has an even more acoustic atmosphere that this “Makes me think of home”.